In this blog post we’ll be talking all about our most powerful, and one of our best-selling proteoglycan ampoules! As you know, proteoglycan ampoules are a pioneering product developed by the MartiDerm Laboratories in Spain, combining active ingredients, proteoglycan and pure vitamin C, creating a unique and extremely effective anti-aging and youth preserving combination. Over two years ago, this exceptional product joined the family and it is here to stay; because it is sure to impress anyone that tries it, as illustrated by its growing number of fans. 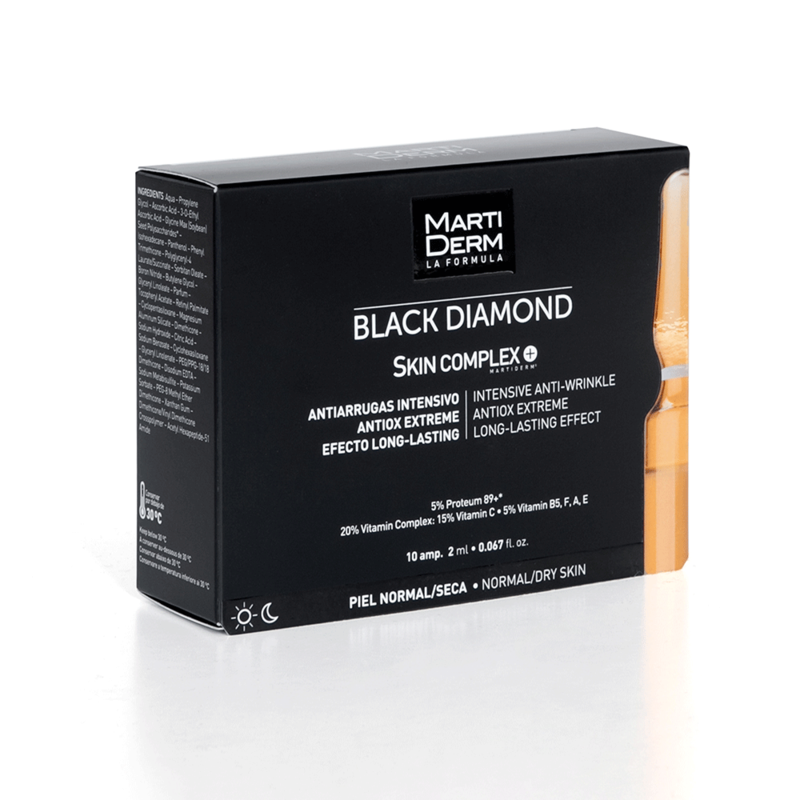 Packaged in an all new sleek matte black box, these are also affectionally know by loyal fans as the “Black” ampoules. 5% state of the art proteoglycans, capable of penetrating into the deepest layers and efficiently stimulating the natural formation of our own collagen. 15% vitamin C: the great antioxidant. Vitamin A: multifunction (improves hydration and firmness, reduces wrinkles). Vitamin F: nourishes, hydrates and repairs. Vitamin B5: restores the skin’s natural barrier. Our proteoglycans, created in 1989, has been developed over the years to produce the newest and best version. Proteoglycan molecules can retain a large amount of water and moisture, providing our skin with elasticity and firmness. The texture of the Skin Complex is unlike any other ampoule in our family. It provides a delightful silky feel, creating a remarkable sense of lightness and comfort when applied on the skin, with no sticky residue. It is suitable for all skin types, including dry and combination-oily skins and it has a high-tolerance for sensitive skins. It is used in the same way as the rest of our range: ½ ampoule in the morning or in the evening applied to the face, neck and chest, always before applying your normal day cream. Clinical studies regarding this unique product show visible results after the first application. The only way to find out if the claims and rave reviews are true is to try it for yourself! What are you waiting for?